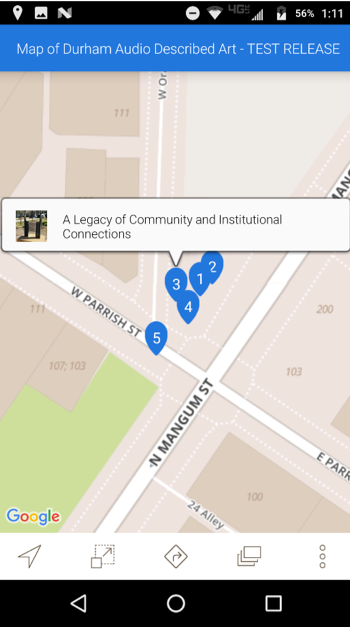 DADA, an iOS and Android based applet built off the MyTours (https://www.mytoursapp.com/) platform is designed to provide blind and low vision individuals access to outdoor art throughout downtown Durham, NC. MyTours is an international platform designed to help users create audio tours of museums, trails, and other walking activities. Duke University owns an instance of MyTours that allowed for the creation of this project. Audio descriptions, video, images, and coordinates are entered the application. The app allows for descriptions of artwork to automatically play when a user comes within proximity to the geographical coordinates. While the platform does have some accessibly friendly features, there are areas of improvement within the app. The MyTours group has been open to feedback to create a more accessible application. Beta testers from the Vision Insights support group, Durham, NC, found that application to be a great first step and they have expressed interest in using the app / helping to further develop the application.